Golf Course: Our 18-hole, par 71 Robert Trent Jones II championship golf course is Audubon certified as an eco-friendly and sustainable sanctuary course – the first in Costa Rica to earn this prestigious award. Beach Club & Spa: Our 60,000 square-foot Beach Club and Spa is your escape to entertainment and relaxation, including a sparkling pool, two casual dining restaurants (seasonal), three bars (seasonal), a full spa menu, and beach and ocean activities. Beach Club access includes free use of our fitness center, hot tubs, steam rooms, Turkish baths, and saunas. Hotel & Resort: The all-inclusive Westin Golf Resort & Spa, Playa Conchal shares facilities with Reserva Conchal. The resort features upscale amenities, including 9 restaurants, tennis courts, a fully equipped gym, and a lagoon-style swimming pool. 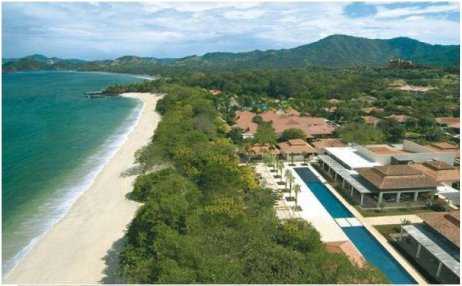 Conchal Beach: Our beautiful community is framed by the turquoise Pacific Ocean and Costa Rica’s stunning Playa Conchal, which is named for the baby-fine crushed seashells that paint our pristine sands. A curved bay overlooks the idyllic Catalina Islands, hot to spectacular underwater sights.